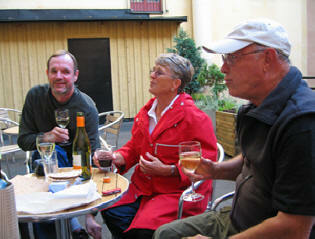 August 27, 2006: Our flight arrived at Årlanda Airport near Stockholm, Sweden. The Scandinavian airline, SAS, was a pleasant way to travel - even if we couldn't take any liquids on the plane. For added excitement, another passenger had a fairly dramatic medical emergency while we were in flight. He was in the seat directly in front of us. Fortunately, the plane's passengers included some medical personnel, who worked hard to take care of him. The man seemed to have recovered as he got off the plane under his own steam. No trip goes off without a hitch. 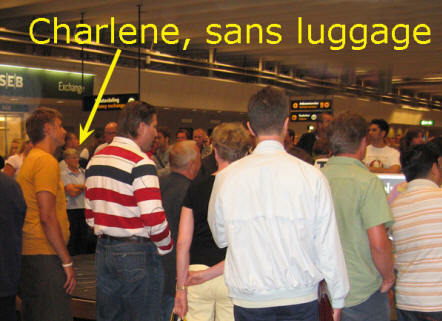 Charlene's luggage didn't show up at the airport with everyone else's. In the ensuing chaos, Sue's camera disappeared. The ultimate tragedy! (Well, from Sue's point of view, at least). But better to lose it at the beginning of the trip, with no pictures in it, than at the end. Jerry let Sue borrow his camera for the rest of the trip. It was either that, or buy a new camera at the unfavorable exchange rate. Charlene's luggage eventually turned up, delivered to our hotel that night. And there were enough photos to make a serviceable scrapbook. Well, you can be the judge of that. One thing we learned from people who had been on a tour before was that it was a good idea to arrive well before the official start of the tour. This would have given us time to deal with all of the little problems, to get oriented and acclimated, and just to be a little refreshed when we met everyone else. This trip was certainly a learning experience, in so many ways. We rode a bus from the airport, then caught a taxi to our hotel. 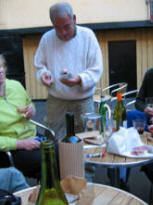 to meet everyone before going on a refreshing walk and then on to dinner. The Hotel Wellington was nicer than a lot of places we've self-booked in the past. It was really pleasant having someone else do all the work of finding decent places to stay. The Rick Steves crew did a stellar job picking out hotels and guesthouses on this trip. 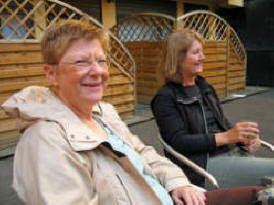 We settled in and looked forward to the next day's excursion. Getting to know one another. We enjoyed cocktail hours on a number of occasions.